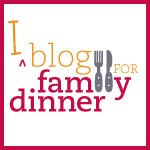 eatdinner.org: The Family Meal—Who has the Time? Many busy families have put the family meal down as an impossible goal, as a relic from olden times. The attitude is something like “It sounds so quaint—the family dinner. Sure it would be “nice,” but really who has time to cook these days?” But you can think of the problem a bit differently: You spend so much time already shopping, cleaning, getting food to the house one way or another. Shouldn’t you be getting something out of it? The family meal is actually one of the times you can reap some benefit from all the work you’ve been doing. You have to eat anyway. Cooking a meal can take 20 minutes. Yes, there’s clean up and shopping time, but you usually have to do that anyway. Though I haven’t read the book, I love the Rachael Ray concept in her new cookbook Just in Time! which has recipes for 15 minute, 30 minute, and 60 minute meals. Love her or hate her, she has a point: Dinner can be a 15-minute quickie or something more in-depth depending on whatever else is going on in you life that night. There are “roasted chicken dinner” days and “tuna salad dinner” days. Both can be equally delicious and rewarding in their place. Honestly, creating the family meal does take some time and commitment, but not really that much more time than re-heating and eating junk and cleaning up the dishes from multiple meals on the run. Make the family meal an important and valued part of your day.